Navy seaman is a designation for the enlistment program option that enables men and women to eventually qualify for one of several Navy ratings (skill specialties) through on-the-job Seaman Apprenticeship training. The program also offers apprenticeship training in a rating that may not be available at the time of enlistment, usually because it's overmanned. After completion of recruit training, enlistees in the Seaman Apprenticeship Training Program attend a three-week course on basic theory in shipboard operations and evolution. Once they've completed apprenticeship training, seamen are usually assigned to shipboard duties wherever the Navy needs them the most. Seamen can request and may receive on-the-job training in a rating that they are interested in, qualified for, and which is available at their first command by completing correspondence courses and personal advancement requirements. A seaman must be recommended by his commanding officer for the Navy rating he wants. Seamen may also attend Navy schools to learn about general damage control, shipboard firefighting, preventive maintenance of special equipment, and the use of special tools used in the rating they are working in or seeking. There's a long and varied list of duties for Navy seamen. They serve as helmsmen and lookouts aboard ships, standing security watches while in port and underway. They also are responsible for repairing, maintaining and stowing equipment in preparation for underway operations, and may work in non-engineering divisions of the ship or station, operating sound-powered telephone systems or doing temporary duty for up to 120 days with food services divisions or compartment cleaning. Seamen may serve as members of damage control or emergency and security alert teams. They participate in Navy ceremonies and take part in underway replenishment (transferring supplies from ship to ship at sea), and they work with qualified personnel to gain job training and experience. Sailors in this job must have normal color perception, normal hearing, and no speech impediments. If you're interested in serving as a seaman, you need to be eligible for a secret security clearance from the Department of Defense. This involves a background check of finances and character, and a history of drug abuse is disqualifying. In addition, sailors in this job must be U.S. citizens and have to be submarine qualified. Seamen are taught fundamental skills needed in a shipboard environment. Most training takes place at the first duty station in the form of on-the-job training in the rating for which they are "striking" or applying. 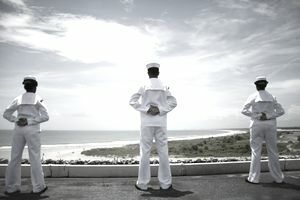 By striking for a specific Navy rating a qualified person may be assigned to a Navy class "A" technical school for further training in that rating. Signalmen usually work outdoors or in a clean, air-conditioned electronic equipment space, and frequently perform their work as part of a team, but may work on individual projects. Their work is mostly mental analysis and physical dexterity. They may be stationed aboard deploying ships or Naval Reserve Force (NRF) ships that deploy or conduct local operations.